Following a previously local successful workshop project, Straightset were approached by Western Toyota to replace their current workshop equipment at their Dunfermline workshop, which due to the equipment specification and location were causing operational issues and not meeting the workshop's requirements. Visiting the Dunfermline site to see the workshop operating, helped the Project Lead to understand what the Service Manager required and the problems the workshop and its engineers were facing. Following this, a full specification and CAD drawing demonstrated the advantages of re-modelling the entire workshop to maximise operating efficiencies and comply with Health and Safety regulations. 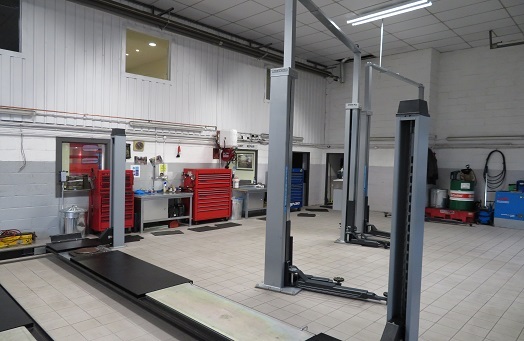 By relocating the wheel alignment bay to a central position ensured greater accessibility and Safety for technicians. The previously unsuitable lifts were replaced with extra capacity Nussbaum Hydraulic vehicle lifts, which could cater for the larger cars within the Toyota range. In addition, water hose reels and standard hard wearing benches were included. As this workshop was in operation, Straightset was sensitive to the fact we needed to limit any downtown. Our experienced installation engineers started work on half of the workshop on a Thursday, leaving the other half operational, then swiftly moved across to the other half of the workshop, the tilers laid the floor over a weekend and were we in commission the equipment by Tuesday. A total re-fit in less than a week. The customer was delighted with the recommended re-modelling of the workshop and impressed with the specification of the new equipment fitted. With a total re-fit within a week, this resulted in a happy customer and happier technicians.